Macro Rails & associated head. I decided to do some macro work and as you know the depth of field is measures in fractions of an inch and auto focus is nearly useless. Earlier this year I built a custom panoramic tripod head that still needs a few parts that need to be manufactured at a machine shop. When it’s done I’ll post more information. I equipped my tripod with a 3-point leveler that has proven to be a blessing when using the pano-head because in order to make stitching more accurate a true horizontal level is vital and adjusting the tripod legs to achieve a level is a true pain. I also don’t like the time it takes to combine all the separate components so I’ve incorporated a Stroboframe Quick-connect system that allows me to quickly connect or disconnect the various components including the camera. Right now I have a Manfrotto ball head screwed onto the 3-point leveler. The working end of the ball head is equipped with a Stroboframe clamp while the 2-axis rail system has a corresponding Stroboframe Plate. Finally, on top of the rail system there is another Stroboframe clamp that is used to hold the camera. 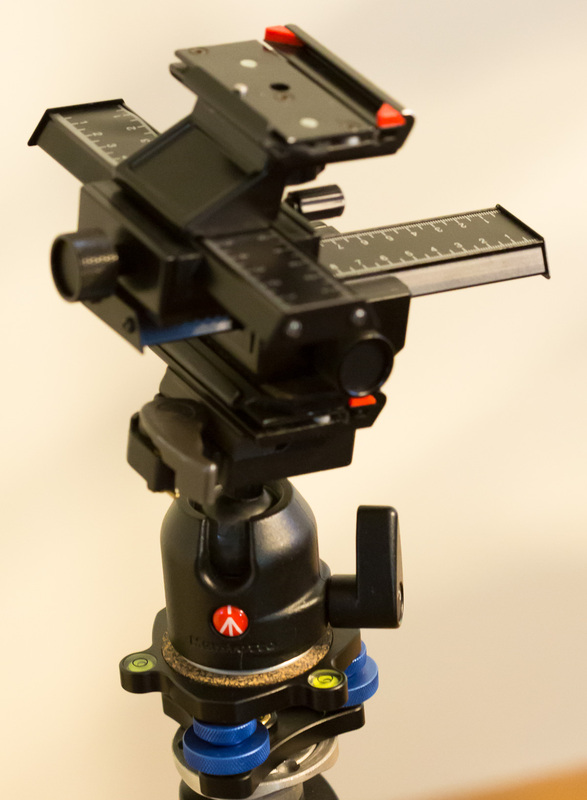 The 2-axis rail system holds the camera and allows me to fine tune the focus without using the lens’ focus ring. Once it was all together I decided to give it a test drive by photographing a drinking glass from the 1960’s; it contains the caricatures of the WBBF AM95 radio station. This entry was posted in NixImages by NixImages. Bookmark the permalink.